Because of added encryption and the physical distance your connection has to travel, your overall internet connection speed is likely to slow down. With the fastest VPN services, however, the drop in speed will be minimal and you will hardly be able to notice any difference in the performance of your internet connection. Below, you will find our in-depth list detailing the 5 fastest VPN services of 2019. CyberGhost is a VPN service based in Romania – an excellent location for maintaining your digital privacy. In addition to its dedication to digital privacy, CyberGhost offers its users amazing server speeds and takes the top spot on our list of fastest VPNs. 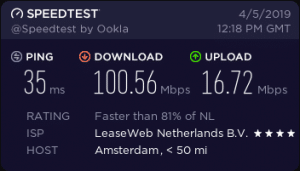 In our testing of CyberGhost’s server speeds, we reached speeds of 106.39Mbps to London, 66.42Mbps to New York, and 143.88Mbps to Amsterdam, for an average of 105.56Mbps. Average upload speed and ping readings for the three locations came in at 13.33Mbps and 65.66ms, respectively. On top of all that, CyberGhost provides a kill switch, allows P2P activity on select servers, accepts Bitcoin payments, and offers free browser add-ons. If you’re still iffy on trying CyberGhost, you can always take advantage of its 14-day money back guarantee on monthly plans or a generous 45-day money-back guarantee on plans longer than 6 months. visit CyberGhostVPN for more information about there service. ExpressVPN is another VPN service known for providing exceptionally fast server speeds. Our tests confirm ExpressVPN’s reputation as one of the fastest VPNs on the market today. 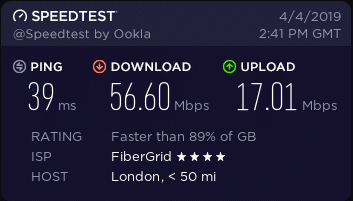 To London, we reached speeds of 56.53Mbps, 64.90Mbps to New York, and 100.56Mbps to Amsterdam, for an average of 73.99Mbps. 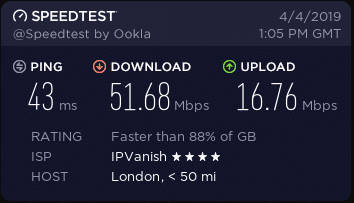 Interesting to note is the speed performance of ExpressVPN’s London servers, from which we would have expected faster speeds considering our location in Central Europe. 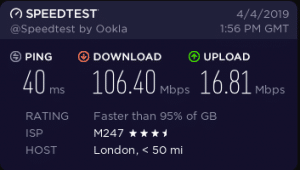 The London server speeds brought the provider’s overall score down a fair amount compared to CyberGhost. 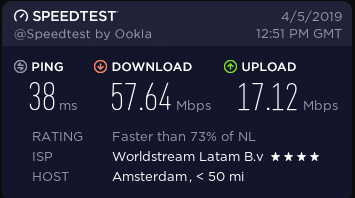 Nonetheless, the speed performance exhibited by ExpressVPN as a whole is impressive. In addition to top-class speeds, ExpressVPN has a very easy-to-use app that basically installs itself on all major platforms, so you don’t have to worry about issues with the installation. On top of that, ExpressVPN has the best customer support team in the industry. They are available around the clock via live chat on the ExpressVPN website. ExpressVPN uses military-grade encryption, so your activity and online communications are kept completely safe. ExpressVPN does not keep logs of your activity on its network and the company is based in the British Virgin Islands, which is difficult for copyright lawyers to reach and therefore great for torrenting. Add onto these factors automatic WiFi protection and a kill switch – plus a private DNS system – and you can see why ExpressVPN is a solid all-around choice. Visit ExpressVPN to take advantage of their 30-day money back guarantee. PrivateInternetAccess (PIA) is a VPN service well-known for its affordable pricing and top-notch security. PIA is also known for being one of the fastest VPNs available. 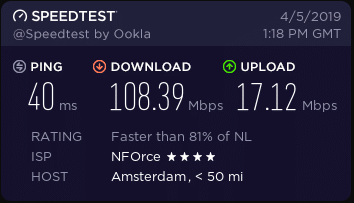 This is evidenced by the speed readings we achieved during our testing: 48.76Mbps to London, 61.55Mbps to New York, and 108.39Mbps to Amsterdam, for an average of 72.90Mbps. 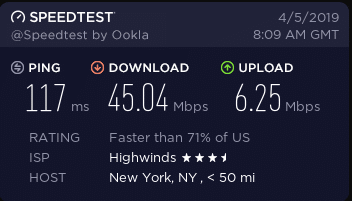 During our tests, PIA’s performance mirrored that of ExpressVPN almost exactly, even with regards to its UK servers registering slower readings than its servers in New York. Overall, however, PIA’s speed performance remains impressive and more than worthy of inclusion in this list. One downside to PIA – they’re based in the US. This means if they were to be served a warrant, they’d have to comply. This is where their no logs policy comes in handy – they might have to comply, but there’s not much they can offer up. Finally, PIA does offer a 7-day money-back guarantee for unsatisfied users. Visit Private Internet Access for more information about their service. IPVanish also offers 60+ server locations, excellent military-grade OpenVPN encryption, 24/7 customer support, and five simultaneous connections. Additionally, IPVanish allows P2P activities and provides users with a killswitch. The IPVanish app is easy to use across the most popular platforms. Although IPVanish cannot unblock Netflix US and (sometimes) BBC iPlayer, it can unblock other streaming services like Amazon Prime. Finally, IPVanish offers a 7-day money-back guarantee for unsatisfied users. Visit the IPVanish for more information about their service. NordVPN is yet another solid all-around VPN provider that offers fantastic server speeds. Our tests measured NordVPN’s server speeds at 56.60Mbps to London, 37.05Mbps to New York, and 57.64Mbps to Amsterdam, for an average of 50.43Mbps. Though slightly slower than the other providers in this list, these speeds still qualify NordVPN as one of the fastest VPNs available and are certainly more than plenty for virtually any online activity. NordVPN is consistently ranked as one of the top VPN providers overall, and the speeds it provides are absolutely first-rate. NordVPN is also a great choice for privacy, as it offers military-grade encryption standards. The NordVPN software also offers a number of other useful security features, which include the ability to connect to the Tor network through a VPN server, as well as the option to use its “Double VPN” technology that incorporates two levels of encryption. NordVPN is based in Panama and it keeps no logs, so it is a good service for torrenters and privacy-conscious users. The app includes a kill switch and CyberSec technology to help automatically block malicious websites and unsolicited ads. Not to mention that the app looks great on all major platforms and is incredibly easy to use! Visit NordVPN for more information about their VPN service. 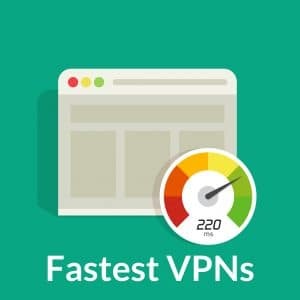 The VPN providers we selected for our fastest VPN list are the providers that best demonstrated in our speed tests that their servers could consistently deliver fast connection speeds in several different geographical areas. We conducted speed tests on servers from three of the most popular server locations for VPN users: New York City, USA; London, UK; and Amsterdam, NL. We ran six-speed tests through two different ISP networks in each location we tested for each VPN provider. 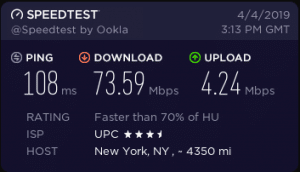 We compared those speeds to our non-VPN speeds to those locations as a baseline to give you an idea how much speed you can typically expect to lose depending on the physical distance between you and the server you are connecting through. 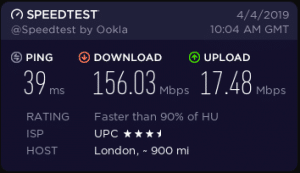 For our tests, we used the speed test tool by Ookla because of both its accuracy as well as its ease of use. When testing the speed performance of a VPN server, it is important to test your non-VPN connection speed to a server in the same geographical area as that of the VPN server you will be connecting through and testing. 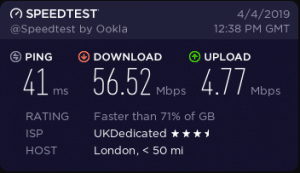 The Ookla speed test tool makes it easy to manually select the geographic region and server through which you want to test your speeds. This will give you a much more accurate baseline reading when comparing your VPN speed to your non-VPN speed. 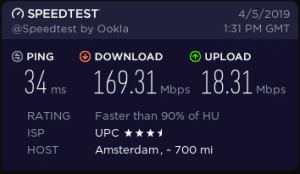 Comparing your non-VPN speed from your actual location to the speed you get through the remote VPN server will not give you an accurate picture of the actual performance level of the VPN server. 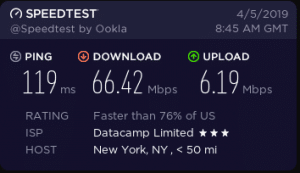 In addition to measuring the download speed of the internet connection, the Ookla speed test measures the upload speed as well as the Ping (Latency) of the connection. Download Speed: The speed at which you download data from the internet to your device. Fast download speeds are essential for streaming or torrenting. Download speed is typically measured in Megabits per second (Mbps). Upload Speed: The speed at which you send (upload) data from your device to the internet. Fast upload speeds are important for smooth online video calling and uploading content. 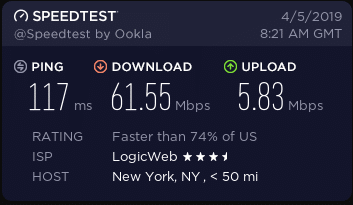 Upload speed is also typically measured in Mbps. Ping: The time it takes to get a response from a server after sending data from your device. The lower the ping time the better in terms of the responsiveness of your connection. Low ping is especially important for gamers who want to reduce their lag time as much as possible when gaming online. Ping is measured in milliseconds. How to choose the fastest VPN server? Select the server closest to your physical location – Let’s say you are in the UK but want to watch US Netflix, then your best bet would be to connect to a server located somewhere on the east coast of the US such as New York City or Washington DC for fastest Netflix US streaming. On the other hand, if you are torrenting and the specific server location is not a deciding factor, then you can simply connect to a server within the country you are physically located. Your activity will still be fully encrypted and your connection speed should barely take a hit. Try connecting through a different VPN protocol – Though you can try playing around with different VPN protocols to achieve faster speeds, keep in mind that you may be sacrificing your security in favor of slightly quicker connection speeds. Many VPN providers offer users a choice in protocols such as OpenVPN, IKEv2, L2TP/IPsec, or PPTP. L2TP/IPsec and PPTP may be a bit faster than the others, but have certain known vulnerabilities that make them potentially less secure. Check the current load on the VPN network and connect to a server with a minimal load – Many VPN providers offer features that allow users to check on the current load (amount of people using the same server) of a particular server in real-time. All VPNs will have multiple VPN servers in the same country, so it should be easy to find a server with fewer users. Conduct an in-app speed test – Some VPN providers, like ExpressVPN, even include a handy in-app speed testing tool that will show you in a matter of seconds which servers are getting the best speed readings from your location. Trial and error – Finally, you can go the “old-fashioned” route and simply try some servers in your VPN server list and conduct your own speed tests. Most VPN providers will have a feature that allows you to save your favorite servers for quick access, so you can find which servers work best for you and save those servers for future reference. 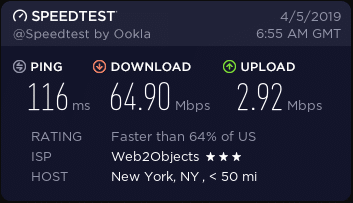 Can a quick VPN bypass ISP throttling? In many cases, yes, a VPN can help with ISP throttling. Some ISPs will throttle a user’s connection based on that user’s activity, which definitely does not seem fair. Thankfully, when you use a VPN, your ISP will not be able to detect what you are up to online, and therefore cannot throttle your speeds based on your activity. 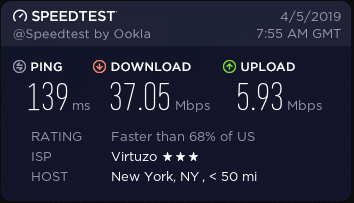 So, in certain cases, a VPN can actually increase your connection speeds. Do VPN speeds differ on Android and iOS? Your VPN speeds shouldn’t differ much if at all whether you are using Android or iOS. The most important factor, in this case, would be the network you are connected through on your phone or device. Usually, you can achieve similar VPN speeds on mobile networks as you would on your home network. Choosing a fast VPN that fits your particular needs will depend largely upon for what specific activities you intend to use the VPN. For instance, if your main objective is to use a fast VPN to unblock Netflix US, then you would need to look at download speeds and if the VPN provider is able to unblock Netflix in the first place. If you want to use a fast VPN for gaming, then you’ll primarily be interested in a low ping rate. Other important features to consider when choosing a fast VPN are the protocols offered, to ensure that you have access to the proper balance of speed and security. Additionally, you’ll want to choose a VPN provider that offers a wide range of servers, to ensure that you have a server in close proximity to your physical location and that you can, therefore, count on the provider to supply fast speeds wherever you may be traveling. We hope that this guide will help you select the fast VPN that works best for your specific needs. We can personally attest to the fact that every VPN provider listed in this article is an excellent choice for anyone looking for one of the fastest VPN services on the market in 2019. There’s really no time like the present to go ahead and sign up for one of the VPNs featured above! I live in California and i’m using ExpressVPN as recommended on your site. You have mentioned in your ExpressVPN review that it is the fastest VPN of all that’s why you have put it on the Top position but here in this article you have placed it at the 3rd position. Why? The main protocol you should be testing is openvpn. Many von providers won’t even offer insecure protocols like PPTP and frankly only a silly person would go to the trouble of using a vpn and then use PPTP. If anyone is looking for Speed in a VPN, do not use a free one. I have tried about 4 services and the free one I learned is less protection and not as fast. I found out you do have to pay to get good service. I wanted one that didn’t do any logging, had worldwide servers, multiple devices at the same time, ultra fast connection. I know thats a lot to ask but if you want to be protected and have your connection encrypted properly, do yourself a favor and pay for a VPN service that actually works. After my research, trial and error and talking to friends I ended up going with Expressvpn I am hoping to save everyone time by letting them know my experience.